Oh yes, this is right up my alley. 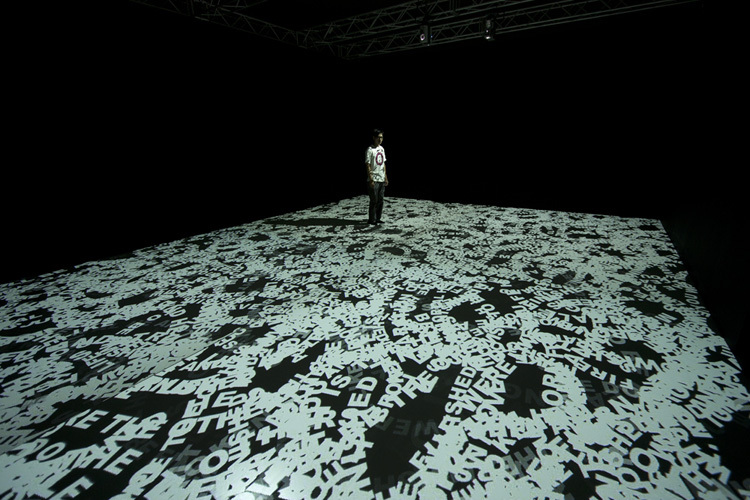 Hong Kong based artist Tsang Kin-Wah incorporates text and type to create dynamic installations. From painted floral-like wall patterns that upon closer inspection are made up of letters and Chinese characters, to his ongoing video installation series titled The Seven Seals, Kin-Wah envelops the viewer in type. The texts formed by that type pose questions on existence drawing from biblical, political and philosophical writings, in many cases meant to provoke a range of feelings from the spectator reminding us of issues like war, terrorism, revolution, death, murder, suicide, self-denial, etc. Presently the latest installation in The Seven Seals, The Fifth Seal – HE Shall Deliver You Up To Be Afflicted And Killed As HE Was, is being shown at the Mori Art Museum in Tokyo through January 15, 2012. This entry was posted in Art, Fun, Interaction Design, Stuff We Like, Typography. Bookmark the permalink.